Even though it has been a full four generations between my last Pokemon purchase and the impending doom upon my wallet on Saturday the 12th, something about this next Pokemon X and Y stand out. Maybe it is because the change from generations 1 to 6 leaves tons of room for change so it will feel like a new game all over again. 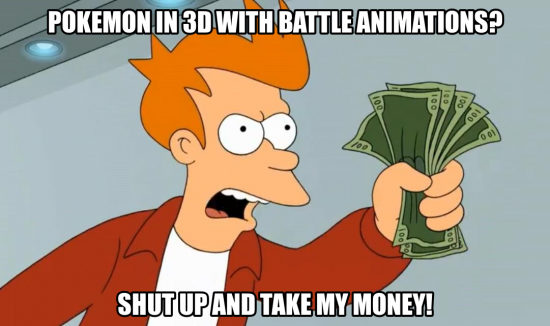 Or it may be because I have been itching for an excuse to purchase a 3DS finally and Pokemon X/Y may be it. So while the purchase of the Pokemon game itself isn’t going to be a big hit, the associated cost of one of the new Pokemon themed 3DS isn’t a price I am looking forward to paying. Then on Sunday October 13th, Skylanders SWAP Force launches with a total of at least 52 new figures being released as well as others probably still to be announced with variants on their way as well. Now I know I won’t buy every one of them, I am going to get at least one of every type for the SWAP Force so that means more than a half dozen in addition to the starter set. At between $8 to $12 a pop, that is going to add up quick. But with friends out here who are as into Skylanders as I am, it is going to be worth the spend. I guess if the options are having too much to choose from that makes you happy or just being bored waiting for something to catch your fancy, the former is definitely the preferred problem. When it comes down to it, age doesn’t seem to matter when it comes to collecting. Between digital pocket monsters in Pokemon X and Y or finely detailed figures that come to life on screen, there are going to be a whole lot of new additions finding their way to my household real soon it looks like.